The 1/4 gallon to 5 GALLON COLOR MIXER is ideal for mixing matched colors, for adding pigments such as glitters and fluorescents to bases and for assuring proper blending of reducers and other modifiers. Designed as an easy-to-use ink mixer for heavier viscosity inks and coatings, the Color Mixer has a basket-holding system that allows screen and offset inks to be mixed in their original 1/4 gallon to 5 gallon containers. Special blade configuration provides gentle and thorough mixing by lifting and rolling without splash-up or air bubbles. The blades simply slide on and off for easy changeover between container sizes without tools. These blades enable the bottom and sides of the container to be thoroughly mixed while air pockets are prevented. Even blending through its "lift and roll" movement --reaching ink that typically settles on the bottom and sides of containers. While reducing viscosity, the Color Mixer turns the formulations up to 15,000 cPs into smooth, workable and ready-to-print ink. Equipped with a standard 1 quart, 1 gallon, and a 5 gallon blade. Replacement mixing blades, including blades for qt and 3-1/2 gallon containers, are available for purchase. This self-centering mixer adjusts to accommodate 1/4 gallon to 5 gallon (1 to 20 liter) containers and includes 3 different sized blades. 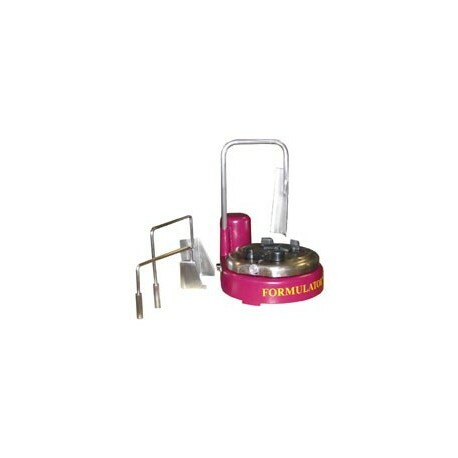 The Formulator Ink Mixer includes fixed and variable speeds and rotates clockwise and counterclockwise. The unique design of this mixer saves time by mixing thoroughly in the original container. It uses a new multi-directional turntable with adjustable locking clamps that accommodates both metal and plastic containers. The special blade configuration provides gentle and thorough mixing without splash-up or air bubbles. • Accepts the full range of U.S. and International container sizes from 1 quart to 5 gallons. • All three stainless steel mixing blades included: quart, gallon, and 5-gallon. • Easy changeover of all three blades.